For the last few septs, Vultog would go through the various tomes of the many libraries in both the Reiklands and Folset, the two kingdoms he knew he was now welcomed in and that had the closest ties to Sterk; the Reiklands as many within its kingdom worshiped her with great passion while Folset had an entire brigade dedicated to her worship stationed at the white walls. What was he looking for? Well... he was not exactly sure. He was not a scholar of any kind, but he had done research before in regards to his animal raising and alchemy. He would focus his time on historical battles and well known military leaders along with legends about his goddess. Specifically, he kept an eye out for any mention of a holy land or shrine of hers that still remained on the vast continent, as well as any sort of artifacts that may have been lost or stashed away that still held her power. Vultog knew that any place that held a great battle was a candidate for what he was looking for, while the military leaders may have once knew and protected these places and artifacts of great importance to Sterk. The work was tedious; he was a slow reader, some in charge of the books were reluctant to help him, and he was away from home. Yet he continued on; it was his duty as an orc and as a faithful of Sterk to find a way to free the War Mother. If he was able to find these shrines or artifacts, perhaps cleansing them from Foli's influence or spreading Sterk's doctrine through these discoveries would empower her and free her from Foli's grasp. Maybe he would even find a clue on how to stop Foli, though that was extremely doubtful. Regardless, if there was any chance that he could help Sterk, he would take it. The question was of course, would his research procure anything of importance? Only time would tell. There had been no leads to Vultog regarding whoever this Gol Thalar was, as he was scarcely mentioned in the texts he had found. 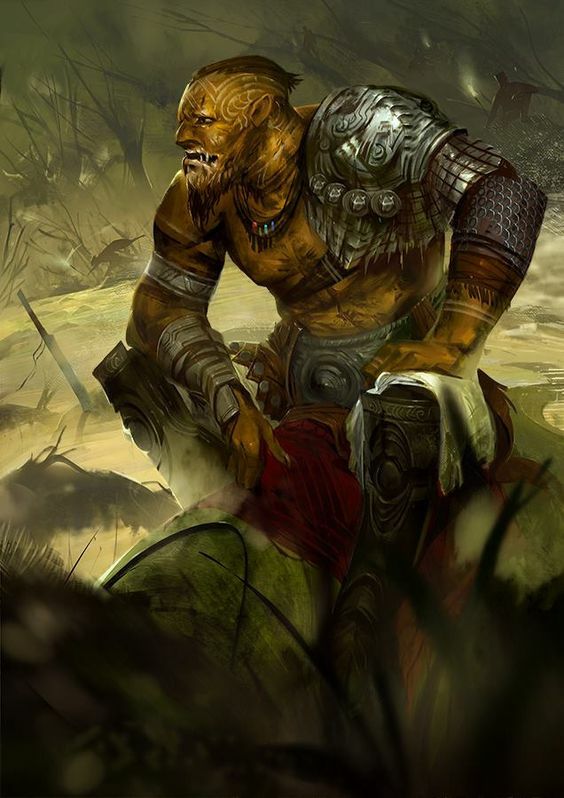 Was he the first of the orcs, another blessed by Sterk, perhaps even a forgotten demiservant? Vultog had asked those of the old world and of old age, such as Avel and Vitae, as well as Priestess Hari, the last of the Sword Sisters but there had been no information to be given. So he forced himself to continue his studies, toiling through even more books and tomes as best as he could to find out more of his forgotten kin. Perhaps in truth he was somewhat disappointed in himself; in terms of people, holy lands, and so forth, he had only found a mysterious name while the Queen of the Reik had somehow come upon a whole map, which had led them to an old shrine of Sterk and home of an ancient warrior order. Perhaps more information would come in time. As for the lessons the books talked of, Vultog could not help but agree with many of the points mentioned such as practicality, respecting ones origin, humility, honor and so forth. However, the irony was not lost on him that the book seemed to directly speak to him of his own struggles with his wife and his rage. Almost as if goddess or someone close to her was directly speaking to him. It lead to some renewal of faith in Vultog in Sterk, and after some time pouring over what he had already learned, he decided to confront, no not confront... to speak to Umaroth to try and mend whatever bond he broke. He loved her, and did not want to lose her. His anger against his enemies, however, was a much more difficult battle to be had.